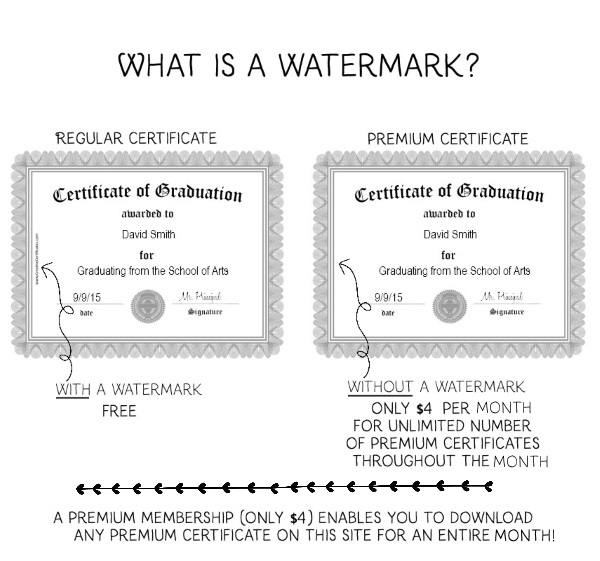 Certificates without a watermark are only available to premium members. The premium version costs $4 for an entire month (introductory price). During this month you can download as many premium certificates as you want and as many copies of each as you need. Many of the certificates on this site are available in two versions: a free version and a premium version. The two are identical, except that the free version includes the site’s domain www.CreativeCertificates.com in small letters which can’t be removed. Download certificates without a watermark and help support this site! All certificates on this site are available for free. Many sites charge for editable certificates. We offer them for free. We believe in offering free content and want to continue doing so. We serve thousands of free downloads every single day. There are many costs involved such as hosting, developing the certificate maker and designing all certificate templates. We cannot sustain the site on our own. To maintain the site we need your help. If you appreciate our service then please consider supporting us and becoming a premium member. How many premium downloads do I get? You can download as many regular and/or premium certificates as you want over a one month period. I signed up for the premium membership but I still can’t access the premium certificates. On some computers, your browser is set to show the cached version in order to serve content quickly. In this case, you will still see the previous version where you had no access to the premium content. If this happens then clear your cache and the problem will be solved. You can also use a different browser if you do not know how to clear your cache. What happens when the introductory price goes up? When you sign up you are given the chance to renew your membership at the same price that you paid unless you cancel the monthly recurring payment through PayPal. If you do cancel, then you will have to sign up again at the current price on the day that you sign up. Do monthly memberships renew automatically? Monthly memberships renew each month for the same price that you paid when you signed up. You can cancel monthly memberships at any time through PayPal. When you cancel you will still enjoy your membership for a month from the date of payment. If you decide to renew your membership in the future then you will be required to pay the then current price which will most probably be higher than the introductory price today. Yes. Our membership payments are handled by PayPal (industry leaders in secure payment processing). PayPal protects your financial information with industry-leading security and fraud prevention systems. When you use PayPal, your financial information is not shared with this site. Once your payment is complete, you will be emailed a receipt for this transaction. Your payment information is never stored on our server and not even shared with us. Are premium downloads different than regular ones? No. The only difference is the watermark. Everything else is the same. If you want to check the certificate maker before then you can create a regular certificate with a watermark. If you like it then you can purchase a premium membership and download the premium certificate. Will will need to create the certificate again using the premium version.